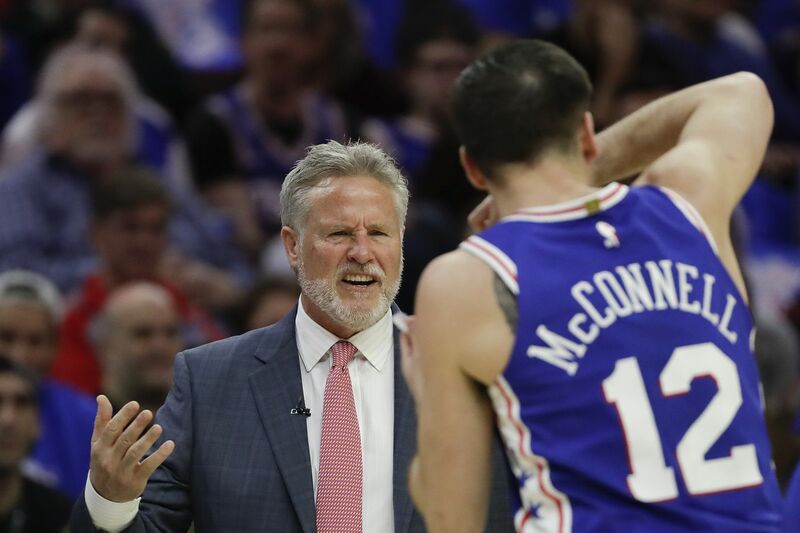 Sixers head coach Brett Brown reacts after a foul call on his team with guard T.J. McConnell during the first-quarter against the Brooklyn Nets in Game 1 of the Eastern Conference playoffs on Saturday. The Brooklyn Nets defeated the 76ers, 111-102, in Game 1 of their first-round playoff series on Saturday at Wells Fargo Center. -- Amir Johnson and Joel Embiid viewing what appeared to be a text message on Johnson’s cell phone in the fourth quarter was a bad look for the team, especially coach Brett Brown regardless of the excuse. The actions by a well-respected, 14th-year veteran in Johnson and Embiid, the team’s franchise player, give the appearance that there’s lack of control and lack of respect. -- The Sixers might have a tough time hiding JJ Redick on the defensive end. The shooting guard opened the game on Joe Harris, who made 3 of 4 three-pointers in first quarter. It didn’t take long before he became the person the Nets sought out to attack while the Sixers were on defense. He was a defensive liability before fouling out in the fourth quarter. -- Philly needs an answer for Ed Davis. The Nets reserve post player had a huge hand in the game’s outcome. Davis finished with 12 points on 5-for-7 shooting and 16 rebounds in 25 minutes, 7 seconds of action. He graded out with a game-best plus-28. -- The Sixers’ lackluster performance shouldn’t come as a surprise. The flaws they displayed in this lopsided contest have been evident for a while. So much so that it often felt like they lost even in the games they won late in the regular season. Players must step up, be more accountable and Embiid needs to get healthier and in better shape. The problem is Embiid will be hard pressed to do that over the next two weeks. - Worst performance: This is a tough one, but I had to give this to Ben Simmons. The Sixers point guard had one of his worst performances of the season en route to posting misleading statistics. The All-Star point guard had 9 points on 4-for-9 shooting to go with 7 rebounds and 3 assists. However, he shot 2-for-6 through three quarters. - Best defensive performance: This was another tough one, but I ended up giving it to Embiid for his five blocks. - Worst statistic: The Sixers made just 3 of 25 three-pointers, 12 percent. - Best statistic: I gave this to the Nets hitting 24 of 26 foul shots, 92.3 percent.